Greetings, all! I hope this post finds you well! Every so often I hone my academic workflow. As far as I’m concerned, this comes with the territory, and it is important to sharpen the saw and increase in efficiency and accuracy. The workflow in the PDF shared below works for me for a good and relatively simple but accurate flow (as far as the DIGITAL side is concerned). ASIDE: About the “sharpening the saw” metaphor: I learned of it from reading Stephen Covey’s books. The metaphor of “sharp­en­ing the saw” is sim­ple: It is coun­ter­pro­duc­tive to spend all of your time saw­ing and neglect­ing to sharpen the saw when a simple SHARPENING OF THE SAW could enable you to get the tree cut down in just a few strokes, saving TONS of effort and work and time in the process. Please let me know if you have any questions about this workflow. NOTE: I am aware that a Prezi with embedded video demonstration of each step in the flow chart would be awesome. Once I’m done thesis-sing, I hope to create such a Prezi! In the meanwhile, feel free to email me or post a question via the comment feature (simply click the “quote bubble” icon above to do so): I’ll answer any questions I can! Wishing you PEACEFULNESS and ENJOYMENT in your academic work. Onwards and UPWARDS!!! This entry was posted in academic workflow, Citavi, distilling information, note taking, productivity, Scrivener, task management, writing by Z. Sanders. Bookmark the permalink. I am wondering about having the seemingly duplicate steps of taking notes within Mendeley and then tagging/sorting those notes and quotes within Citavi. I can certainly see why you recommend Citavi – it looks perfect for lit reviews/academic workflow and I am looking forward to playing around with it. So why involve Mendeley at all? For cloud storage of all materials? I work well when I have a marked-up copy of article/book to refer to. Programs that allow for annotation would seem to suit me well – the ability to highlight pieces and use colors or icons helps jog my memory as I skim back over the source. Can Citavi link to a marked-up version of the resource? It would be a cool feature if each note/quote in Citavi could link to an anchored point in the reference file (e.g. .pdf) so I can refer to the context of that quote! Given that marking-up is a key part of how I digest information, perhaps I am looking for a more automated way of exporting notes/quotes from an annotated article (in Mendeley or maybe a different annotation program? one that works on ipad?) to a program like citavi where those blocks of information can be sorted and rearranged. But it seems like additional busy work to copy and paste each note from an annotation program into an organizer. And wouldn’t it be a great feature if these blocks of information could also export to a concept mapping tool! The database structure of Citavi facilitates getting the chunks of information in the right bins, then a freeform mapping program could enhance finding indirect relationships, noting holes, finding contradictions, etc. If anyone has already thought about these issues and come to any conclusions I would really appreciate the advice! Thank you for the reply above. So, I totally, 100% get your points, observations, and feature desires above. You might take a look at the free program Docear. It allows for JUST what you are describing: concept mapping, PDF annotations to be imported, pointers to places in PDFs created, etc., etc. 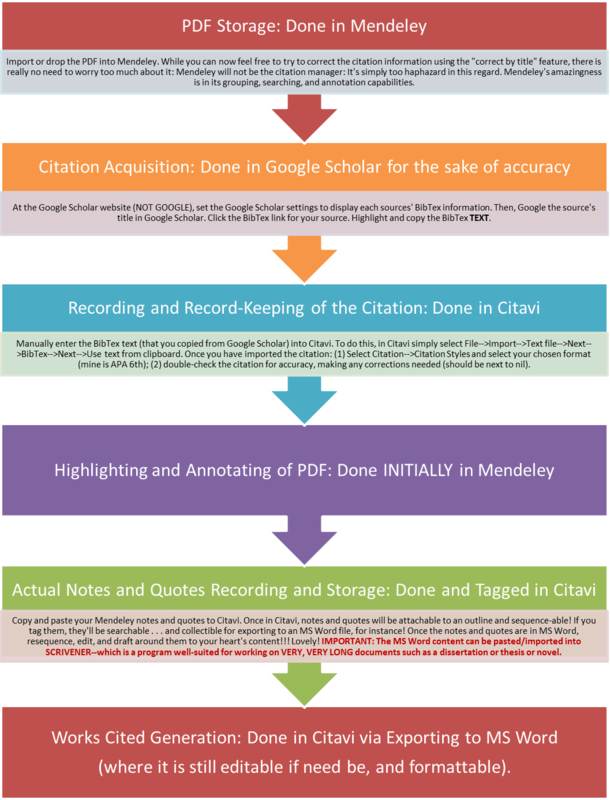 About the the seeming “double work” of annotating in Mendeley: It is totally possible to print a physical copy of a PDF, annotate it, and type quotes and annotations into Citavi, bypassing Mendeley altogether. Sometimes I do this, especially when pressed for time or when a PDF is very long. However, I have discovered that I get a lot from annotating in Mendeley: For very dense, long, or theoretically complex pieces, when I’m first annotating, it’s like I’m having a conversation with the PDF. I like being able to tack thought bubbles at words and paragraphs in the PDF the way Mendeley allows. I like that when I click on the pane to the right, a large NOTES text box is displayed above a text box containing the collection of all ANNOTATIONS I’ve made to the PDF. I can do some “thinking” here, as I have been empowered to see things juxtaposed. Then I can just do a quick copy and paste from Mendeley to Citavi of ONLY that which is most useful. I guess to summarize, the “extra step” in Mendeley allows me to keep Citavi quotes and notes lean and uncluttered. I can dump and think and work in Mendeley. Citavi is where I set quotes and notes up to became components of a paper or section I’m writing. Regardless, I have discovered that Mendeley affords DEEP, DEEP searching of PDFs. And I have discovered that it is VERY valuable to markup a PDF with markups that “float above” the actual PDF–as they do in Mendeley–and do not permanently change the PDF. You can export the notes and annotations. I prefer to just copy and paste the “keepers” or those notes/quotes needed into Citavi, once I’ve worked out what is actually needed. So, yes: It is totally possible to skip annotating in Mendeley. I do it all the time. However, I find I appreciate being able to go back and see my thinking and notes and highlights in Mendeley, sometimes years after they were made. Take care, and please let me know what you think of Docear. It might be right up your alley! Thank you so much for your response and the program suggestion. Docear looks like such a unique program–I love how you can be working with a mind map and click on a node to be taken to that point in the PDF. You’re right, that’s exactly what I was envisioning! I really like how you describe the additional benefits of the 2-step process you describe. There is certainly value in -as you describe- having a conversation with the text. Just because a workflow is super-efficient doesn’t mean that it helps the researcher gain the greatest level of clarity. Sometimes I find that hand writing notes and then being forced to revisit them in order to get them into a digital format helps me digest the material better than if I had the notes on the computer waiting to be searched for. One of my goals as I embark on a new academic project is to give attention to REVISITING my recent thoughts/questions/conclusions/etc and BROWSING to notes I have collected for interesting connections and tidbits I have probably forgotten.